The Reporter ribbon introduces a range of easily accessible features, activated by clicking on a report header and clicking the Reporter tab. The options available on the ribbon depend on the report type that is clicked on, feature activation and the permissions available to the logged in user. The refresh button enables you to override caching settings to ensure the version of the report you are seeing is the most up-to-date. If a personal report exists, you can toggle between it and the default shared version of the report. Users can create their own version of a report and set it up the way they want. The personal report is saved and users can toggle between the default shared report and the personal report. Show the Report Information Window. You can access all of the BrightWork Reporter distribution options via the Reporter ribbon. 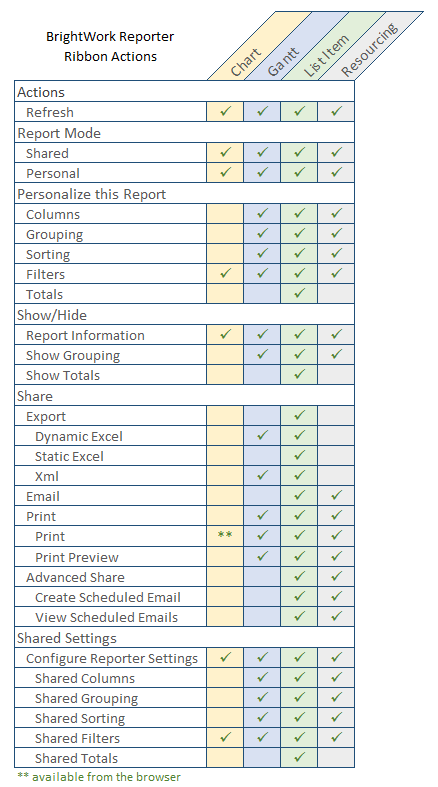 Users with the correct level of access can configure the shared report.